Partimus is thrilled and humbled to thank Partimus co-founder Maile Urbancic for another generous donation of $182.00 on behalf of her business, Boutique Academia. As we blogged about here, Boutique Academia, a small company run by Partimus co-founder Maile Urbancic, has created some beautiful gold-colored and silver-colored earrings and necklaces created in the shape of the Ubuntu human family logo. Maile has graciously decided to donate $10.00 from the sale of each pair of earrings to Partimus. She will send Partimus checks reflecting those earnings every time she receives enough sales to send us at least $100.00 in earnings from the earrings and from the necklaces. 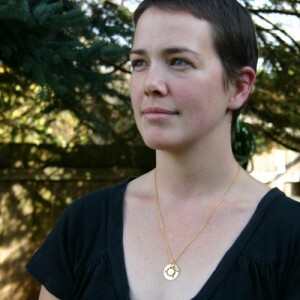 The Ubuntu necklace, in gold color. We are so proud of these earrings and necklaces, because they are beautiful, and they promote the Ubuntu theme of one human family. Partimus’ work in schools is about delivering high-quality pre-owned computers to students, but the bigger picture is teaching students and teachers about the power of sharing. The Ubuntu human family logo fits right in with this theme. Of course, Partimus was founded by two women, Maile Urbancic and Cathy Malmrose, and women have always played a big role in the governance of Partimus and in the projects that Partimus runs. So there has always been an important theme within the Partimus DNA about advancing and supporting girls and women in STEM (Science, Technology, Engineering, and Math). We are happy to support Boutique Academia in providing women and girls with small motifs about the blending of jewelry with STEM themes, which is what Boutique Academia is all about. Thanks again to Maile for her continuing inspiration in helping Partimus to go forward! 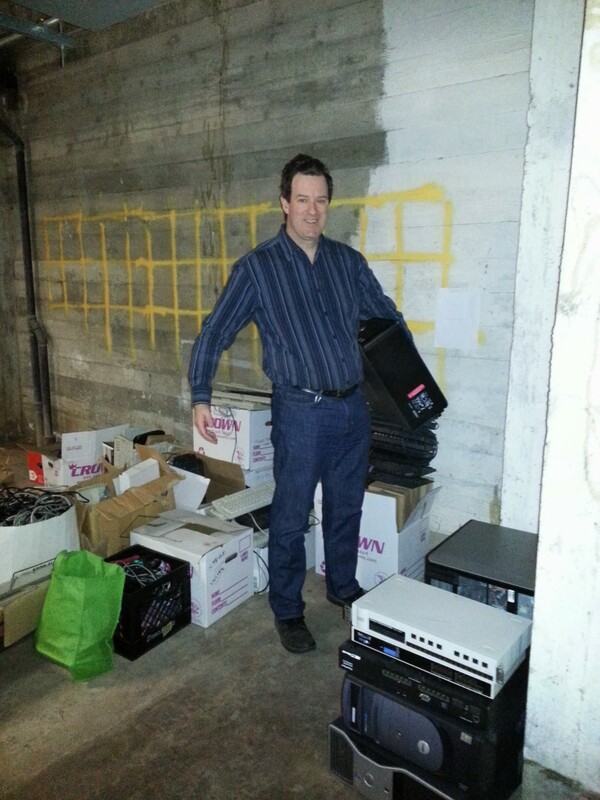 A couple weeks ago we wrote about the work of Partimus staff members to load up several machines for Robert Litt and schools in Oakland details here. 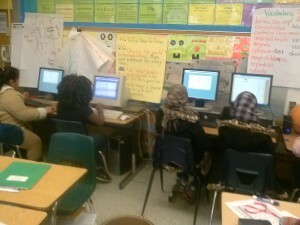 We’re now happy to report that those computers have been installed with Lubuntu and put to use! 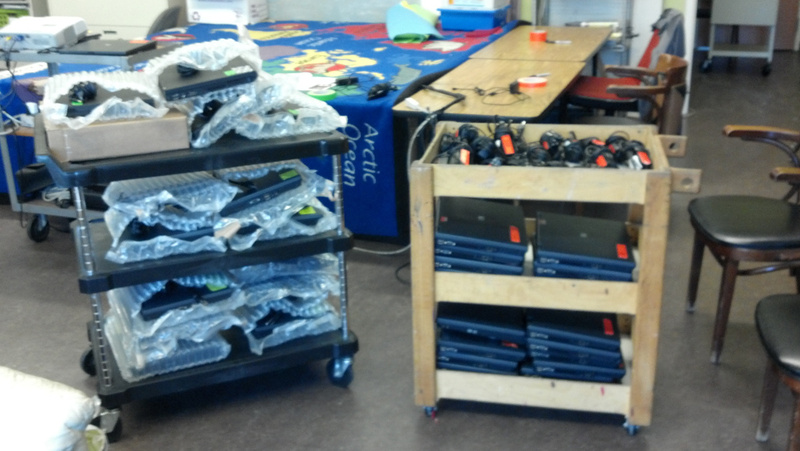 Thanks again to our volunteers who helped get these systems in the hands of students. Happy Holidays from Partimus! At ASCEND I built a lab from computers, donated to us, by running them on a Linux operating system that is free and open source… I was able to repair or replace computers, through the use of a free open source operating system… I turned Prescott around, using the model I used at ASCEND. … Prescott now has 65 fast working computers. because it was more stable. More significantly, Linux represents a collaboration between business and the community. 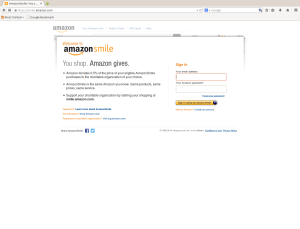 transparency and openness that Linux draws its true value. and is why Linux belongs in our public schools. Robert was granted the autonomy to continue to operate his Partimus’ supported lab. 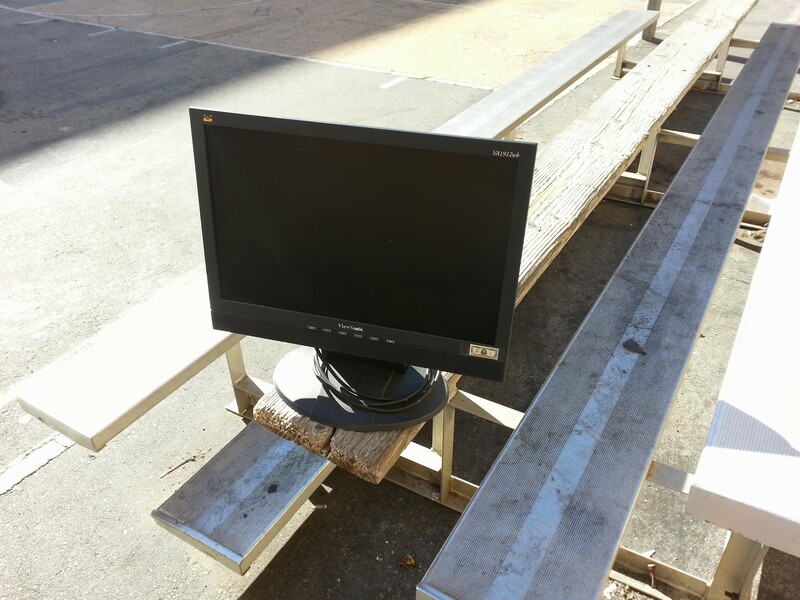 Partimus engineers have now been tasked with developing and building a standalone custom lubuntu install CD for “Alternative Operating Systems” at Oakland Unified. Stay tuned for its release later this quarter. For James, it was a real thrill to enjoy the success of community collaboration. 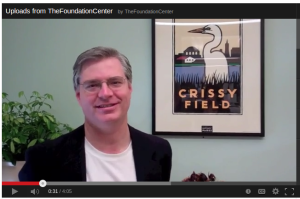 Partimus Board of Directors member Grant Bowman was featured in a video this month by the Foundation Center. Link here: The Foundation Center-San Francisco: How can we help you? Grant has taken time out of his busy schedule to attend several classes at the Foundation Center to help further the growth of Partimis. Thanks to him for all of his work and taking time to discuss Partimus in this video, and to the Foundation Center for making these resources available to non-profits like ours! On April 28th, the Partimus crew of James Howard, Morgan Wilson and Christian Einfeldt worked to take laptops that James had prepped for installation and finished imaging the systems with the provisioning server. All the laptops were then put together with their power supplies on cart. By the end of the day between already installed laptops and newly installed ones approximately 38 laptops were ready for the classroom! The project we’re wrapping up today is perfectly representative of most of the school deployment projects we’ve done. 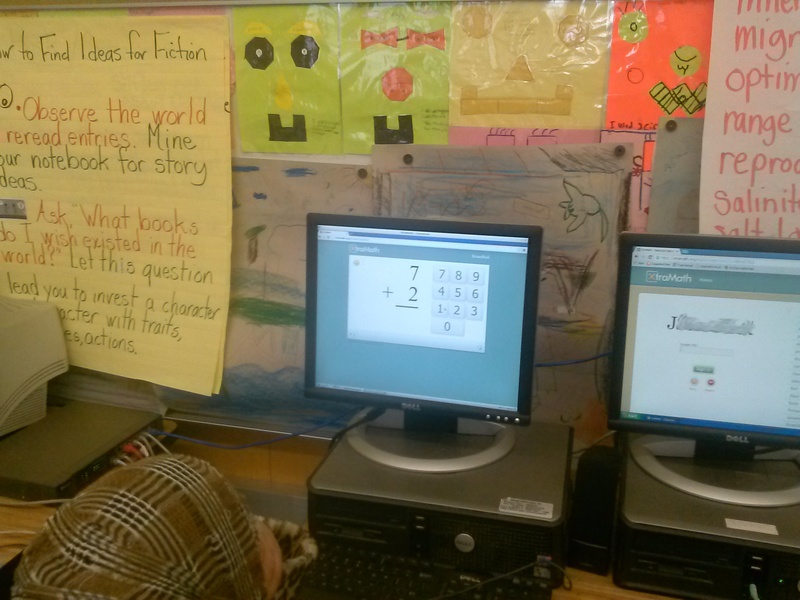 A project begins with request from an educator for computing capabilities. Once it’s determined that suitable hardware is available or can be procured, we work with the teacher to determine software requirements. This process yields a list of software packages we’ll include in addition to the distribution base install. We also try to develop an approach to how the system will be administered, which users should be created and with which authorization. Lastly, we try to incorporate desktop tweaks to suit the preferences of the particular client. All of this information is translated into a post installation shell script. This script, along with other installer-specific declarations are hosted on a local installation server which also contains a full, up-to-date mirror of a particular Linux distribution’s software repository (usually Ubuntu). Our automated installs are currently exclusively network based, but much of the hardware we work with will only bootstrap by CDROM, so we usually master custom media for boot strapping the installer. Once we’ve worked out the install design and all the hardware kinks, we do some test deployments and conduct a little QA with our educator. Once design is finalized, we go to production. It’s really cool seeing dozens of machines churn through an unattended install in unison. For this project we decided to go with Lubuntu 12.04 LTS to squeeze maximum performance out of these notebooks. Many of these notebooks will be used by the students to give multimedia presentations, and what’s really exciting is that some of these higher spec machines will be used for video production as they are loaded with about a dozen of the best video production tools available from around the globe. 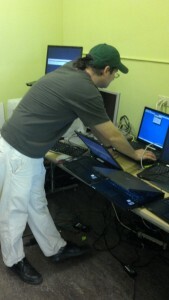 When I arrived, I got to work assisting James with staging and loading about a dozen laptops with Linux. James already had a couple of CDs with the applicable configuration, so it was simply an assembly-line task of connecting power and network cables to two laptops at a time, and then launching the installation. Once they were running, two more laptops could be connected and launched. There was one laptop that would not read a CD. In order to further pinpoint the cause, I swapped the CD drives between the bad boy and a known working lap. The CD drive worked in the other lap, and the bad boy continued to fail. This proved that the problem was elsewhere within the laptop. We marked the laptop bad, and saved the CD drive and memory cards for spare parts. Then I moved on to bundling and labeling laptops and power supplies. 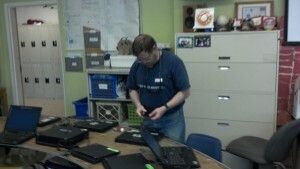 By the end of my two and a half hours, I think we had labeled and bundled almost thirty laptops. The highlight of the day was the two slices of broccoli-pineapple pizza that I inhaled with gusto. This was a flavor combination that I had never heard of before. Weirdly excellent. Thank you again for the opportunity to pedal my wares. Special thanks to CACS parent Robbie Socks for procuring the donated notebooks from Lycée Français de San Francisco and thanks again to the crew for joining us in this event! Partimus.org is going to be hosting a pizza party and triagefest / installfest tomorrow (April 28, 2013) at the Creative Arts Charter School at 1601 Turk Street at Pierce St in San Francisco from 1 pm to about 3:30 pm. The Creative Arts Charter School is a public charter school. 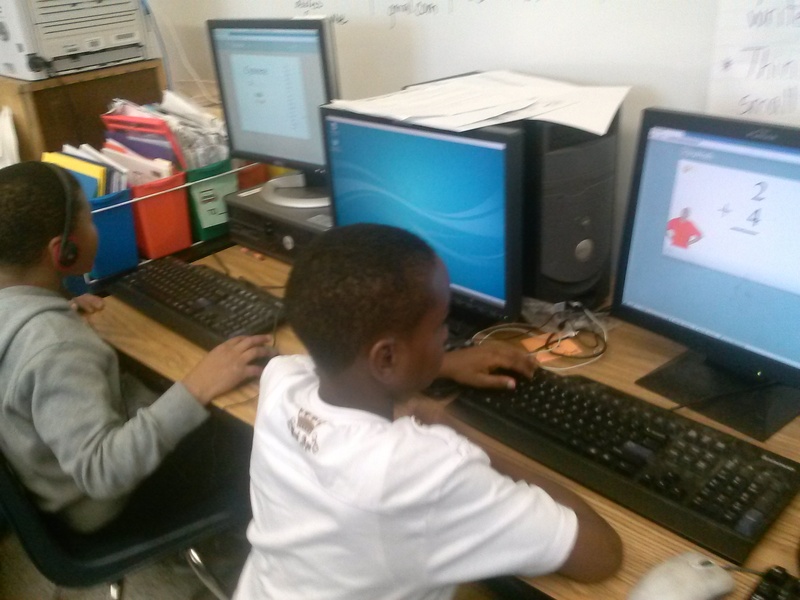 Any child in the State of California can attend the school for free without paying tuition. 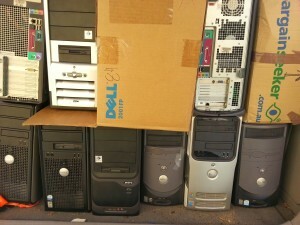 We have about a dozen machines to install with GNU-Linux. Mostly detail work (packing notebooks up, numbering them). If there’s human resources and interest, post installation work could be done (log in, connect to the wifi, validate that a browser works — that sort of thing. Q/A basically. Bring USB sticks with Lubuntu 12.04 on them. 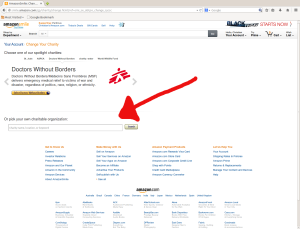 If you don’t have that, Ubuntu 12.04 will do. No need to worry about UEFI. Please also bring everything that you would need to triage hardware. Screw drivers, needle nose pliers, etc. When you arrive, please text or call Christian at 415-351-1300 so that I can let you in, as the school is quite large, and you could get lost. Thanks! On February 23rd Christian Einfeldt gave a talk at the Southern California Linux Expo on Successful Linux Labs in Schools. whether it is Linux or Apple or Microsoft. physical presence at the school is needed, or the lab will fail, whether it is Linux or Apple or Microsoft. During his presentation he shared photos from several of the Partimus schools, including the Prescott lab in Oakland, Creative Arts Charter School in San Francisco and he discussed his involvement with the KIPP San Francisco Bay Academy. He also focused on the people who make all of the work at Partimus happen, and how vital their commitment is to the success of our labs. Our pilot was with a woman named Sky in Washington State, a retired programmer and system analyst who now helps people get set up with computers running Linux-based distributions. 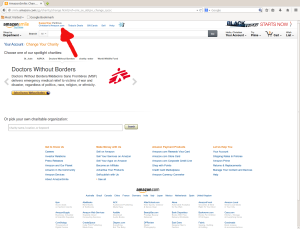 More details about her work can be found on our Laptops for Linux Users program page. We were delighted this month when she sent us an update of her work, facilitated by this donated laptop and gave us permission to share it. Two years ago in March of 2011, you graciously gifted me with a beautiful ZaReason laptop through the efforts of Cathy Malmrose of ZaReason Computers. I am writing today to catch you up on what I have done with the much appreciated machine. Since March of 2011, I have collected through donations over a dozen old laptops. 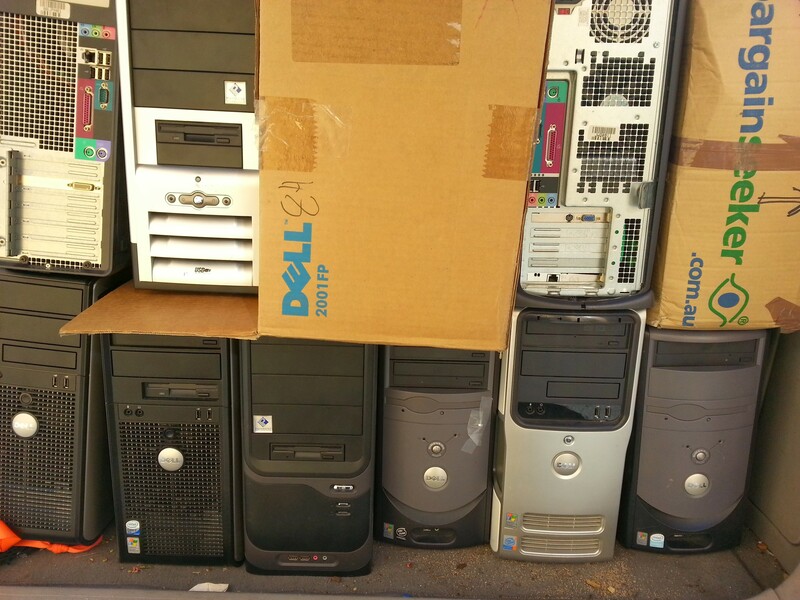 I clean them up, put a Linux OS on them and then give them either to low-income people who need to search for employment and/or housing or I give them to low-income “tech-adverse” seniors. The machine you gifted to me is perfect for the job. 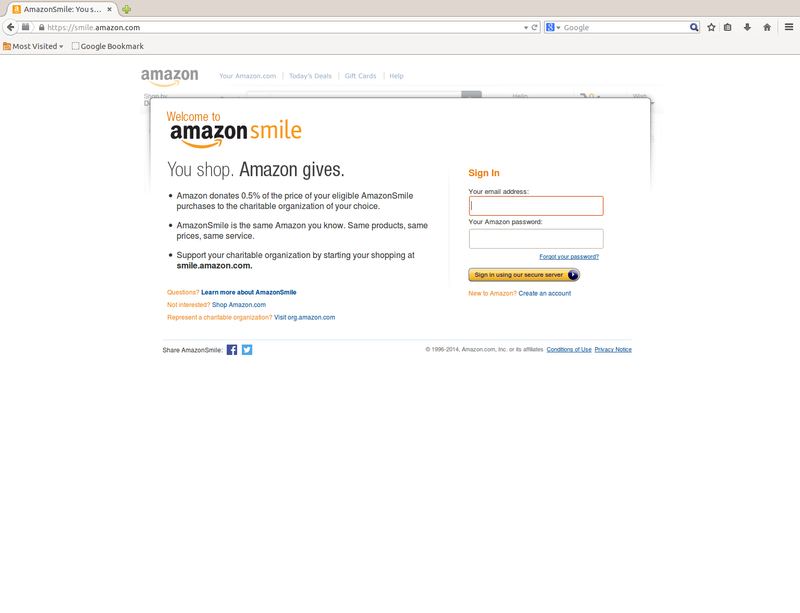 I normally put a Puppy-Linux OS (Lucid family) on the donated machines. Often times the laptops are missing hard drives. I am able to make live CD’s and live USB sticks with the ZaReason because if it’s many ports. I use Puppy Linux for the operating system as it runs well and fast on old laptops. And, Puppy can be easily customized to suit the user. For example, when I set up a machine for “tech-adverse” seniors, I put two big buttons on the desktop. 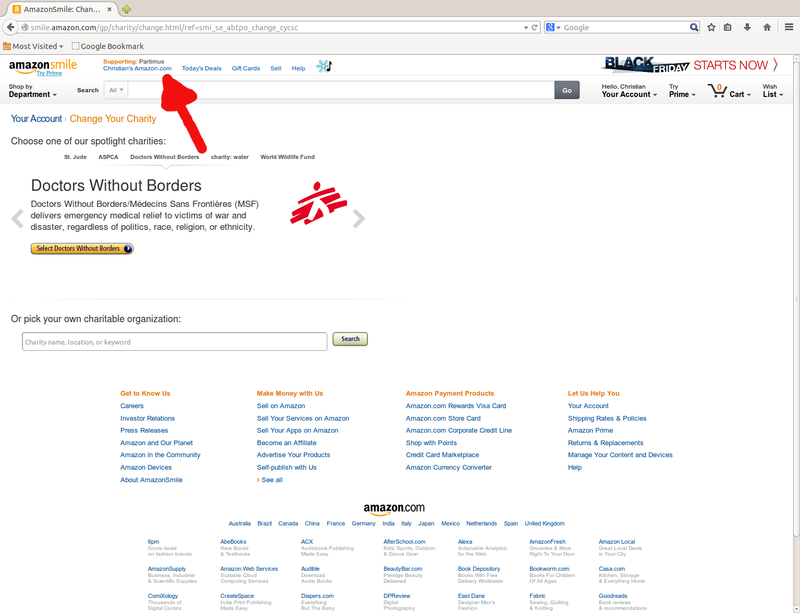 One says, “browse the internet here”, the other button says, “get your email here”. Works every time. I am grateful to Partimus, Barry Kauler, the creator of Puppy Linux and to the John Murga Puppy Linux forum for providing resources and good humor in this endeavor. If anyone has any questions about how I go about doing this, please do contact me. 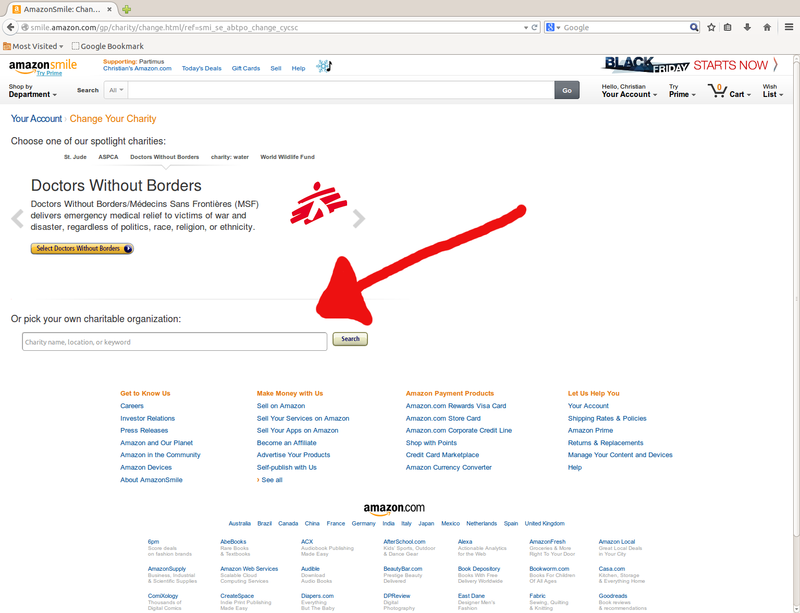 This small effort to further the Open Source community is most rewarding. Keep up the amazing work, Sky!